This post originally appeared on Navy Grade 36 Bureaucrat. It can be found in its original form here. 1. It calls out the Senate directly on UNCLOS, but doesn’t address ISA. UNCLOS was originally opposed due to the International Seabed Authority (ISA), which does such un-American things like taxing sea bed mining for distribution to other countries and mandating technology transfer. The military normally focuses on the navigation portion of UNCLOS, which it has abided by since the Regan era. The problem comes when the US is encouraging nations to use UNCLOS while not actually having ratified the treaty. There isn’t an easy solution, short of removing the ISA from UNCLOS, but expect to see UNCLOS ratification cries in the near future. 2. It calls out everyone on the South China Sea. It’s not just China. 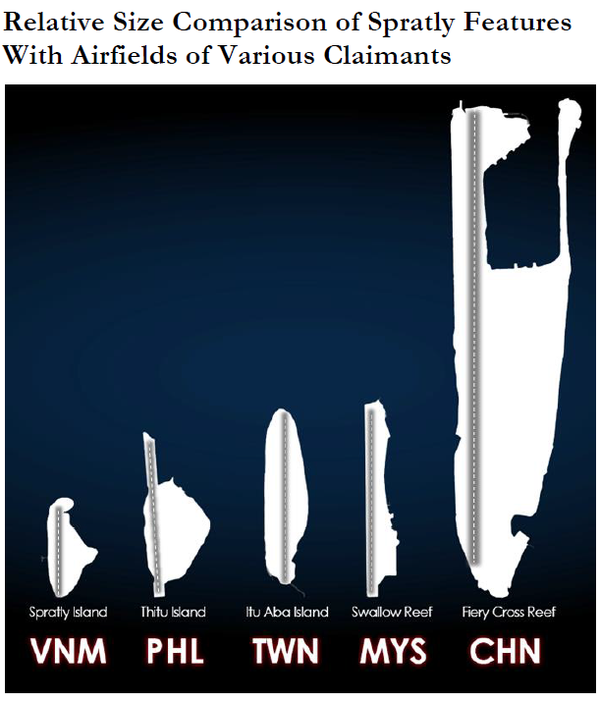 Every claimant in the South China Seas has issues. This document clearly spells that out, taking away a talking point from the PRC that the US is overlooking the other countries to focus on China. But it pulls no punches on China, going after the “so-called Nine-Dash Line” as an excessive claim. 3. It spells out why the Senkakus became a problem. Most people view the Senkakus as a bunch of rocks that China and Japan hold in dispute. Very few know that the Japanese government bought them in order to prevent the Governor of Tokyo from buying them. This was actually an attempt to prevent a clash with China, since the Governor was rightwing and would likely have stoked the issue. This narrative has been lost to China’s narrative about how Japan “changed the status quo,” so it’s good to see it spelled out here. 4. It puts India as a model for dispute resolution. Comparing the India/Bangladesh maritime dispute resolution to what is occurring in the South China Sea is no accident. This document clearly spells out US support to India, likely in an attempt to spur continued Indian investment in their “Look East” strategy. 5. It denies territorial sea around reclaimed islands. 6. Freedom of Navigation (FON) is coming to you. Coming on the heels of stating that PRC reclaimed land is an excessive claim, this is a really good sign, although realize that future FON operations will likely include challenges to all claimants (and make diplomatic efforts interesting). 7. It accuses China of changing the status quo. 8. It calls out A2/AD and how we would stop any short war. It gives vague language to DoD efforts to combat A2/AD, but it does say that it’s happening, with “robotics, autonomous systems, miniaturization, big data, and additive manufacturing.” It also later mentions that we’ll be dispersing around the Pacific, into more Japanese bases and places like Australia. This complicates PRC targeting. Will the PRC risk war with the US if we have units spread out everywhere? They don’t have enough missiles to hit everything, and striking into a country like Australia means that any sort of “short, sharp war” on their part quickly expands…something that will cause a lot of angst on their end. 9. It calls out information sharing with allies. I’ve long argued that sharing data with allies is too hard. At the CJOS-COE we worked hard to make Carrier Strike Groups use networks that supported integrating ships from non-“Five Eyes” countries, like Germany and Norway. We proved that successfully, and in the Pacific we’ve integrated South Korean and Japanese ships before. But what about Malaysia? Indonesia? Brunei? We get some play at RIMPAC, but not enough. The disaster that was ABDA in World War 2 wasn’t that long ago. We need to get friendly nation integration right before any shooting starts. 10. It’s got great graphics. Ryan Haag is the Hawaii CIMSEC President and an Information Warfare Officer navigating the uncharted waters of the Information Dominance Corps. He can be reached through his blog at The Navy’s Grade 36 Bureaucrat. Both the article and 10-things missed may make for nice reading, but they suffer from a narrow Pentagon perspective. Aside from being another annual America-wants-to-retains-it-claim-as-world-power George Kennan theory-of-containment piece by building an interlocking NATO-like structure, you need to understand that China is well integrated into the economies of all these Southeast Asian countries, and has very large Chinese business diasporas in all of them. So saying China needs to build trust with its neighbor is more than a little naïve, its just plane delusional. Second, the U.S. conveniently excludes its own expansionist (Manifest Destiny) history in its comparisons to others. Think of the illegal takeover of Hawaii by the Navy as our example of establishing a “first island chain” comparable to the small rocks and reefs China is rapidly laying claim to, or Guam as the “second island chain” resulting from our trumped up war with Spain. Plus, where’s any recognition that China’s claim to the islands between Japan and Taiwan may be legitimate (as opposed to using America’s handing them over to Japan after WW2), and thought of in the same way. Their political activities seem completely rationale and reasonable given their long-term historical perspective and 100-year game plan to rebuild their culture and world standing as a great power. They’re just establishing their defense perimeter, the way we did in Europe and tried to expand eastward when the USSR collapsed by extending NATO. How is what they’re doing any different? Combined with a lack of quantitative data about who’s ships transit those waters (mainly Chinese ships carrying Chinese goods to Chines customers), using a map-based defense rationalization appears juvenile. And regarding those pretty graphics, I agree I like them. But where’s the U.S. 7th Fleet? Maybe even have a sidebar on the 3rd Fleet contingency availability? Otherwise, this is one of those how-to-lie-with-statistics tricks. Also self-delusional is the reference to technology. The U.S. will only have a temporary, if that, advantage with China. Do you really think a country that builds all America’s cell phones and most of its computers is really going to give us any slack? Last, any military-only strategy suffers from a lack of imagination. All that financial support the U.S. is providing should be financed through user fees for the commercial ships that transit the area. After all, that’s what all this coordination, mainly maritime law enforcement, is all about – supporting commerce. With China and the other Southeast Asian nations benefiting from our Navy and Coast Guard subsidization of their responsibilities, it’s time they pay up. But really last, what do you think would happen if the U.S. backed down a bit from our America-is-the-world’s-only-superpower (or biggest bully on the block) posturing and let these countries figure out how to play nice with each other? Do you really believe war would result? I don’t. Look at Australia. They just signed a 50-year deal with China for iron ore and coal, which is going to let them finance their navy modernization. You don’t see them forward deploying forces closer to China. So, really, what’s the big deal? Btw, disingenuous claims that it’s not about China aren’t fooling anybody. You can’t “call out” other claimants, proceed to hand them millions, formulate your entire doctrine and strategy against China, then proceed to sit back and innocently pretend it’s about neutral enforcement of “freedom of navigation” (by which we really mean military reconnaissance and surveillance).